My first introduction to Elizabeth Knox's writing came here at Strange Horizons , in Nina Allan's recent Short Fiction Snapshot entry, in which she wrote about Knox's story "A Visit to the House on Terminal Hill." As Allan astutely points out, Knox's writing in that story, in which a surveyor/lawyer team in 1953 try to persuade a member of the land-owning, truculent Zarene family to turn on his cousins and give his consent to a hydroelectric dam project that would flood their land, has a lightly ironic tone that only intensifies its sense of weirdness and horror. Details like the surveyor being trapped by his host in a window seat which also contains some unseen, odd-smelling, and weirdly angled object, or being released by someone who looks like his captor but speaks in birdsong, are discussed evenly and casually, and left unresolved at the end of the story except to intensify the warning given by the pair's rescuer, that "the Zarene family are best left alone." I was intrigued, and when I learned that "Terminal Hill" was a teaser for Knox's latest novel, my course seemed clear. As I later discovered—and perhaps should have known already—Knox is well known in her native New Zealand as an author of prize-winning literary fiction. In the mid-00s she made the shift into YA fantasy with the Dreamhunter Duet ( Dreamhunter , 2005; Dreamquake , 2007), which take place in an alternate New Zealand called Southland in the early years of the twentieth century. Mortal Fire takes place in the same universe in the late '50s, and though its story stands alone—to the extent that, on a first read, I wondered why Knox had bothered to create an entire alternate universe in which to set a story that might easily have fitted in our own (though there is magic in Mortal Fire , it is known to a select few, and most people don't believe in its existence; the premise, in other words, of many reality-set fantasy YA novels)—it is clearly overshadowed by the events of the Dreamhunter Duet, which are referenced as a national trauma whose effects are studied, and experienced, by the novel's young protagonists. Our heroine is sixteen-year-old math prodigy Canny Mochrie, who is packed off to spend her last summer before university with her stepbrother Sholto and his girlfriend Susan. Working as a research assistant to his father, a renowned leftist academic (invariably referred to as the Professor) who is writing a book about the emergence of labor law in Southland, Sholto is traveling to the town of Massenfer to collect testimony about a mining accident that occurred there thirty years earlier. Susan, an anthropology student, is coming along to study the local folklore and safeguard the equipment, on loan from her department (it is one of the novel's amusing period notes that everyone in it is so frantically protective of what is essentially a tape recorder). Canny is being sent along because her mother, Sisema, is traveling back to her home of the Shackle Islands to receive a medal for her heroism during WWII, when she single-handedly paddled a canoe carrying two downed and injured air force pilots from the Japanese-occupied Islands to Southland. Canny makes the journey under protest, because it prevents her from being by the side of her best (and only) friend Marli, who was infected with polio and has spent weeks in an iron lung with little hope of recovery. At Massenfer, Canny discovers the Zarene Valley, home to the family of the same name. She also discovers that the writing she's been noticing her whole life—unseen by everyone else but seemingly able to affect reality, and which she has termed "Extra"—is being used by the Zarenes for everything from household tasks to hiding a certain house on a certain hill. When Canny makes her way up the hill (after overcoming the Zarenes' interference and several obstacles they set in her path) she discovers a teenage boy, Ghislain, who has been kept imprisoned and trapped at the same age for the suggestive period of thirty years, and who is also the creepy, imprisoning host from "A Visit to the House on Terminal Hill." On one level, Mortal Fire feels remarkably old-fashioned for a YA novel. It's not just that it eschews the current craze for romance-tinged dystopias told in the first person, but that the type of story it tells—about a girl who goes on summer vacation, discovers magic that the grown-ups around her are either denying or hiding, and investigates it nonetheless in the hopes of using it to save her friend—is familiar from so many YA novels from my childhood (back when they still weren't calling it YA) that today it feels almost quaint. At the same time, however, Knox is clearly working to make her historical moment come alive. Her characters—whether they're young university students or reclusive farmers—clearly think of themselves as modern people. Whether or not they're happy about the way the world is changing—the Zarenes are still fighting the dam project and growing increasingly anxious about it—none of them are denying or decrying those changes. Issues of race and gender are also handled in a way that stresses the characters' belief in their own modernity, and their ability to overturn and rectify the old-fashioned norms of yesterday. Due to a decree handed down by Sisema, Sholto and Susan introduce themselves as an engaged couple while they travel together, and make exasperated jokes about being asked to rent separate rooms when they stay at the Zarene guesthouse. But they're also very nonchalant about being sexually active. Canny, meanwhile, is a girl with a prodigious talent for something decidedly unfeminine, and though we see her encouraged to downplay her skill—in a math championship, she's told to pretend to consult with her (male) teammates because her teacher has had it uncomfortably pointed out ot him that "it was a girl who was the power behind his school's great effort" (p. 24)—she's also taken seriously for it, and expected to do great things with it. She's also taken seriously despite her race—the Shackle Islanders are one of several non-European minorities in Southland who are presumably standing in for the various Polynesian peoples of New Zealand—though at the same time expected to prove herself because of it. As Canny muses when she meets another non-white schoolfriend, "They were expected to put up with feeling uncomfortable at University—surrounded by white students. They were supposed to put up with feeling out of place so that their kids wouldn't . (That was one of the many sensible things the Professor had said to Canny.)" (p. 415). It is, in all, a portrait of well-meaning but also quite privileged leftism. Being privileged has insulated Canny from a lot of the prejudice that her race and gender would otherwise have left her vulnerable to, and given her more opportunities, but she is never without the understanding that what she's been given is on credit, as it were. That she must earn it, rather than receiving it by right. For most of Mortal Fire that awareness is bubbling just under the surface, emerging at odd moments to cast a new light on the novel's events. Canny's name, for example, is short for Akanesi, but many people in her life call her Agnes. It's never made clear just who—Canny's stepfather, her teachers, Canny herself—made that change, but when Ghislain quotes the familiar fantasy adage about names being too powerful to share lightly, Canny muses that her confused identity is actually protective. In discovering magic, too, the issue of race and culture, and Canny's outsider-insider status in Southland (she is, after all, a descendant of the native people made to feel like an interloper) is both raised and twisted. When Canny discovers that her Extra is understood and used casually by the Zarenes, she is disappointed—"though she'd been calling it hers for years, someone else had made it, for their own purposes. . . . The sadness Canny felt was similar to the feeling she had when her teachers talked about 'our European Heritage,' and she went on for a time, head down, scuffing her feet, and whispering, ' Not mine, not mine '" (p. 98). But as she spends more time in the valley, Canny discovers an innate understanding of the Zarene magic that allows her to not only understand what the writing that she sees all around her is doing, but to change and alter it to suit her own purposes. As one of the Zarenes observing her finally concludes, she owns the magic more completely than any of the people who lay claim to it. The combination of a well-realized alternate world, a historical setting, a complex magic system which Canny spends much of the book working out, and issues of race and gender, can leave Mortal Fire feeling a little scattershot. Various subplots, such as the history of the Massenfer mine accident, or Sisema's story of struggling with prejudice from Southlanders and, when she returns home after the war with an illegitimate child, from her own people, or Sholto's mingled desire to strike out on his own and his cowed politeness before his father, feel like novels in their own right without enough room to grow in the shadow of Canny's story (though all of them reflect back and inform Canny's experiences, especially the central mystery of the identity of her father). Even within the main plot, some strands feel more perfunctory than others—Canny and Ghislain's immediate, powerful attraction seems to exist more to move the plot along, or because it's only to be expected, than because it has emerged organically from the characters. Knox's narrative voice still possesses the cool precision that made "A Visit to the House on Terminal Hill" so cutting, but it's in service of a baggier story, one that dismantles much of the weirdness that permeated "Terminal Hill" (the questions raised by the story, for example—what's in the window seat, who is Ghislain's double—are all answered, and the cruel humor that seemed to characterize the Zarenes in it is replaced by a more mundane humanity). This is, of course, the right call for the kind of story Knox is trying to tell, but it means that Mortal Fire is a very different beast than the perfectly formed bit of strangeness that was "Terminal Hill," one that is perhaps best appreciated for its parts than its whole. Those parts, however, are definitely worth appreciating. Canny's growing understanding of magic, and her ability to use and alter it to achieve her goals, are where much of Mortal Fire 's force lies. Knox doesn't simply tell us that her heroine is smart by making Canny a math prodigy with a photographic memory; she shows us that Canny is smart by having her work out the secrets of the Zarene Valley, and the tricks that the Zarenes have employed to hide those secrets. Observant and clear-sighted, Canny sees, and understands, more than the readers do. Her logical leaps—such as when she works out that a windchime on the porch of the Zarene guesthouse sounds when someone is lying, and that she is being subjected to a lie detector test—are presented to the readers with most of the necessary steps missing, forcing us to catch up to her, and to grasp what a sharp intellect Canny possesses. That intellect is only one of the ways in which Knox complicates her novel's old-fashioned template. It is matched and enhanced by Canny's cold bloody-mindedness, her almost ruthless willingness to lie and manipulate in order to satisfy her curiosity about the house on Terminal Hill. Throughout the novel we are told—by strangers and people close to her, in exasperation and genuine distaste—that there is something wrong with Canny. "It is only that Akanesi's face doesn't move. Her muscles are damaged. That's why she doesn't smile like a normal girl" (p. 17), Sisema imperiously lies to Canny's principal, who has sent a letter complaining about Canny's aloofness, and when Canny shams emotion in order to manipulate Sholto into enabling her quest up the hill, she is remarkably clear-sighted about what she is doing—"Now that Sholto wasn't going to perform his part in her play, Canny no longer felt guilty about deceiving him" (p. 199). By the time Canny meets Ghislain, the reader will for some time have been wondering if Mortal Fire 's heroine isn't a sociopath, and whether in Ghislain, whom the rest of his family treat with mingled disdain and terror, she may not have met her match. In order to unlock her power and free Ghislain, Canny must find her "Master Rune," the letter that represents her true identity and full potential. In a novel whose heroine and love interest are both imprisoned (literally, in his case) by people who tell them who and what they are, the importance of such a device is obvious. Unlocking her power, and identifying its source, allows Canny to step away from a system that never entirely made room for her—"I'm much happier to think that I'm not completely human than to go on feeling that I'm a human being with something missing" (p. 431), she announces (which also feels like an interesting twist on the unfortunate fantasy convention of replacing non-European races with fantasy creatures). 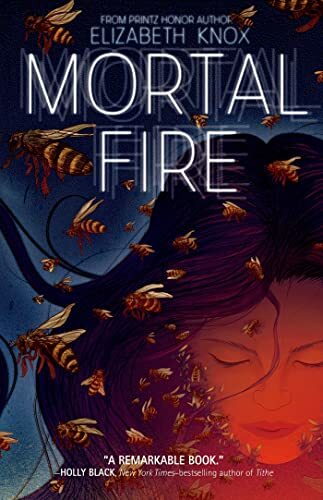 If Mortal Fire doesn't quite manage to replicate the power of that statement (or of the short story that persuaded me to read the book) throughout its length, it at least makes the moment feel earned and triumphant. And it persuades me that, in any genre, Elizabeth Knox is an author worth getting to know better. Abigail Nussbaum (anusbaum@netvision.net.il) is the Strange Horizons reviews editor. She blogs on matters genre and otherwise at Asking the Wrong Questions. You put so well into words a number of feelings I had about this book - there were times I felt 'lost' and thought it was because of poor writing (which it COULDN"T BE - Knox is flawless in her skill) or my dull brain. Your comment about Canny's cleverness and leaving the reader behind resonated and made me feel less stupid.